Brand recognition is nothing new; the use of image as an immediately identifiable expression of the power of the state was one perfected by the Roman emperors. Today heads of state have a standard image: identical portraits of Queen Elizabeth II look down on courtrooms and public offices from Canada to the Cook Islands, from Australia to Antigua; of the President of the United States from Alaska to Hawaii. Similarly at the peak of the Roman Empire, citizens and slaves alike would recognise the same portrait of the emperor from Spain to Syria, from Scotland to the Sahara. Like so much which is unmistakably Roman (gladiators, wine, the Colosseum) it was an idea borrowed from the Greek world. 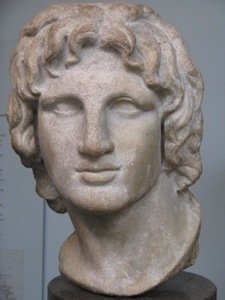 If Alexander the Great’s favourite sculptor and “spin doctor”, Lysippos had perfected the young, dynamic, studiedly casual, and carefully ruffled warrior, it was a model which Rome’s first emperor would emulate; like Alexander, and unlike the Hellenistic kings which had preceded him, Augustus was clean-shaven and ever youthful. 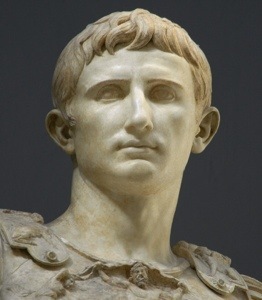 Perpetually about nineteen in his statues (though he died at the age of 76), Augustus is always identifiable by his “swallow-tail” fringe. The protruding ears and broadly spaced locks of the fringe are characteristic of the successors of the Julio-Claudian line. 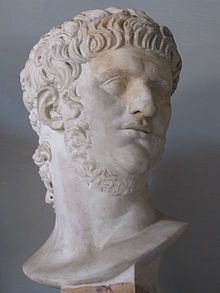 One might be tempted to seek a somewhat facetious correlation between the implosion of the mother of all dysfunctional families and the only ruler thus far to toy with facial hair, the famously mad, bad, and dangerous to know Emperor Nero. After Nero met his sticky end, Rome was plummeted into the rocky “year of four emperors”, from which the solid general from Rieti, Vespasian, would emerge victorious. A salt-of-the-earth sort of chap, Vespasian used official portraiture as one of many tools to show the regime had changed. The effete aristocrat Nero had been replaced with a man of the people. 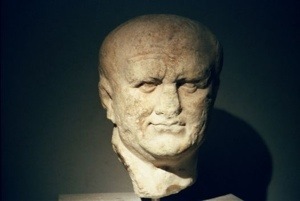 Rugged and pock marked, Vespasian’s statues are carefully styled to tell us that this is a man too busy with matters of state to bother about his own image. When Vespasian’s second son Domitian proved to be Nero mark two, the Flavian dynasty also came crashing to an end. 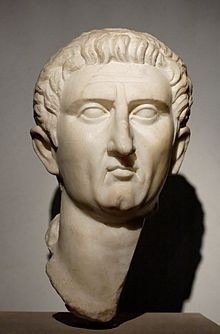 The Senate put the relatively elderly and unmarried Nerva on the throne, the most important emperor no-one has ever heard of. His portrait shows an ascetic and disapproving man, his brow furrowed with the concerns of state, furnished with an aristocratic nose which could open envelopes. Once again the official portrait was a clear expression that he was the anthesis of what had gone before. 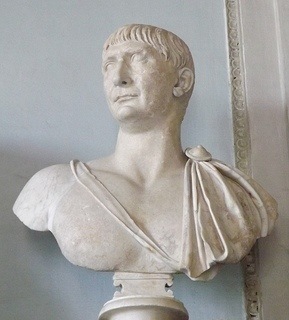 With no natural heir, Nerva’s nominated successor was Trajan, the man who would rule over Rome’s greatest territorial expanse, always shown clean shaven with a pudding basin haircut and rather large ears. Trajan would also die without producing offspring, and his nominated successor was his distant cousin, Hadrian. Bearded and with curly hair, Hadrian’s portrait was different to any of the emperors which had gone before, a sort of Greek philosopher look. He is always shown full-faced and, if we are to believe the busts, without a wrinkle until his death aged 62. 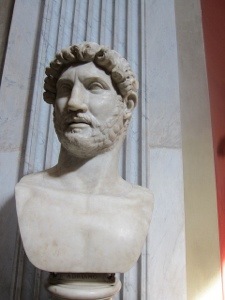 Hadrian also died without reproducing, and his chosen heir was Antoninus Pius. How better to show a continuity of the reign than to have the same haircut? 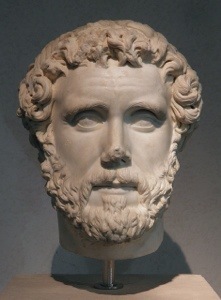 Antoninus Pius, National Roman Museum, Palazzo Massimo alle Terme. 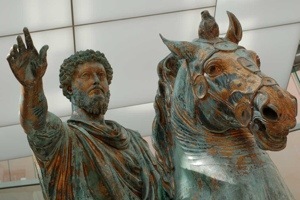 Antoninus and his wife Faustina had lots of children, although only girls survived beyond infancy, and once again a successor was nominated: Marcus Aurelius. Albeit slightly more bouffant, he is also in the bearded mould of his immediate predecessors. Marcus Aurelius (detail), Capitoline Museums. This run of what Machiavelli would term the “Five Good Emperors” – Nerva, Trajan, Hadrian, Antoninus Pius, Marcus Aurelius – would come to a screeching halt with the natural son of Marcus Aurelius, Commodus who, despite the previously successful beard and curly hair combination, would prove to be what Machiavelli might have termed a “Dreadful Emperor”. 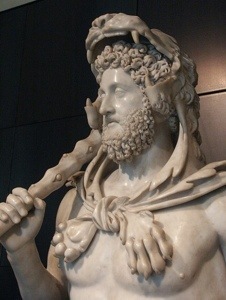 Commodus as Hercules, Capitoline Museums. The hubris encapsulated in showing the Emperor in the guise of Hercules would herald the long, but ultimately inexorable, decline of Empire; a poor advertisement for hereditary rule if ever there were one. A gallop through Imperial portraiture could be incorporated into a tour of the Capitoline Museums, the Vatican Museums, or the splendid and vastly under-visited National Roman Museum at Palazzo Massimo alle Terme. Agnes, another delightful romp through the Romans from a new angle.